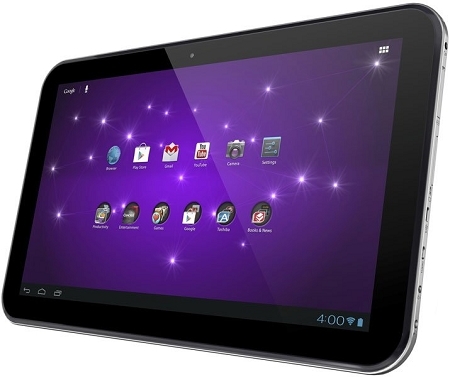 The AT330 (Excite 13) Tablet delivers a big-screen tablet experience, giving consumers a whole new way to use a tablet. The large 13.3-inch diagonal AutoBrite HD+ display features a cinematic 16:9 aspect ratio and 1600 x 900 screen resolution, ideal for the web, movies and games, while 10-finger touch support opens up new possibilities for apps. Equipped with quad speakers, plus integrated ports for convenient connectivity to TVs, smartphones or laptops, the AT330 (Excite 13) Tablet's essential features and durable portability deliver a total tablet experience. This Android powered tablet offers a speedy quad-core processor for greater multitasking and better entertainment, making it the ideal choice for growing families or empty nesters looking for a robust tablet with a large-screen view.